While I realize it’s not an actual Bible verse, it’s kinda the unofficial motto that should be lovingly displayed in my kitchen. 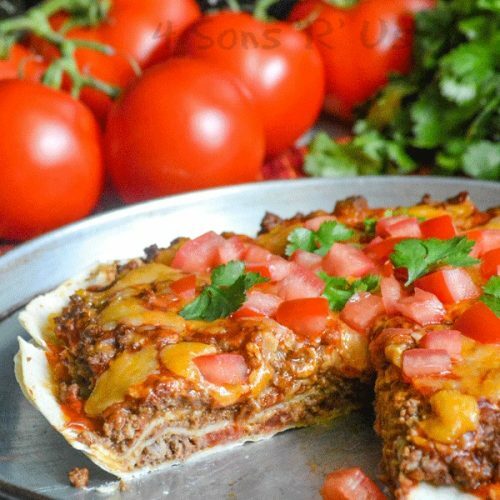 We love, love, love Mexican-themed foods. In fact, one of our most popular recipes of all time is for Mexican Street Corn Salad. I even managed to find a way to give our favorite salad a perfect twist with our Mexican Chicken Caesar Salad. If you love it as much as we do, you simply got to check out these Mexican Street Fries with Salsa Ketchup and our quick & easy One Pot Mexican Chicken & Rice (more commonly referred to as Arroz Con Pollo). Our intense love of tacos, and all things Mexican also extends to the Americanized Tex Mex version of many classics- like Tacos. And by extension Taco Bell. We’ve had a serious, some might call it sickening, love of the famous fast food chain’s tasty Tex Mex treats for years. You can’t go wrong with their tacos, and we love a good chalupa, gordita, even the nachos are yummy. 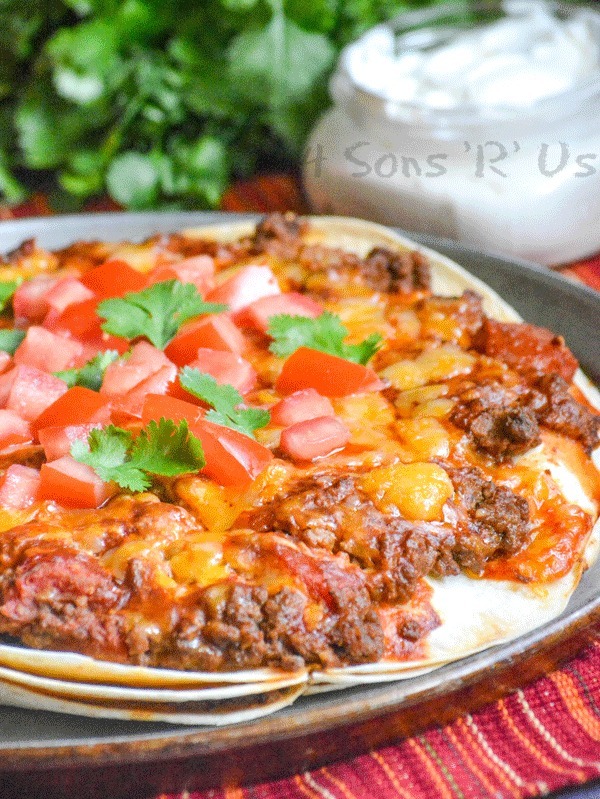 Our family favorite though, without a doubt, is their Mexican Pizza. But buying 6 of them can get pricey, especially when there’s no way my teens (or even my 8 year old who can often out-eat them) are going to get filled up on just one of those bad boys. So naturally, as with everything else- I took the original family favorite, brought the idea home and turned it into a hearty casserole style, filling family dinner dish. 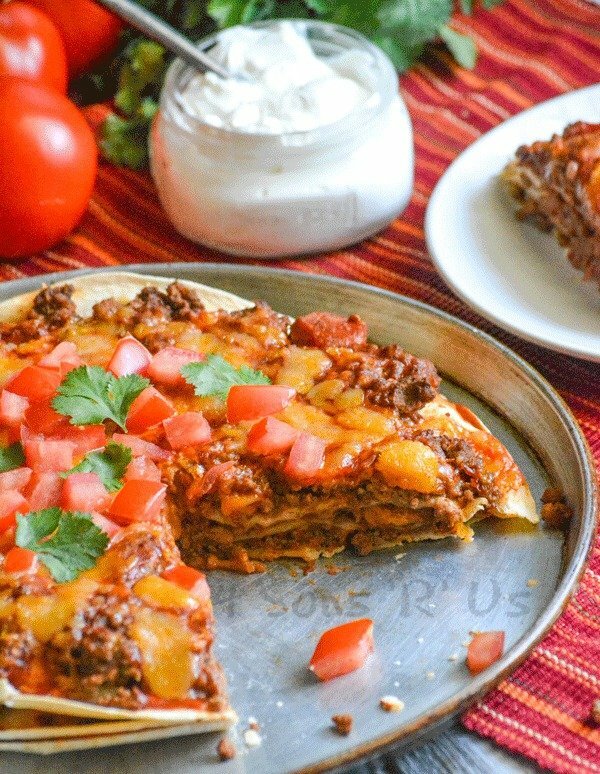 Behold, the beauty that is this Meaty Double Decker Mexican Pizza! 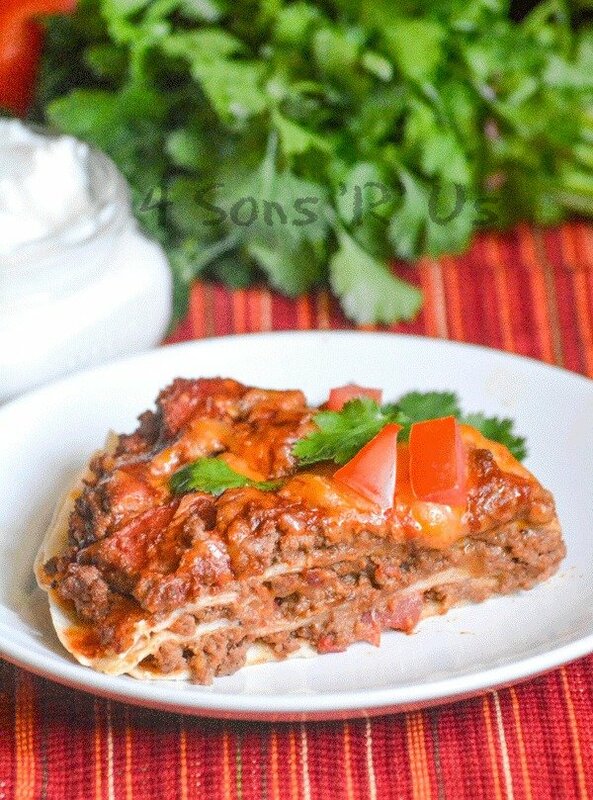 Layers of flour tortilla hold a rich mixture of seasoned ground beef, beans, and ooey, gooey melted cheese. 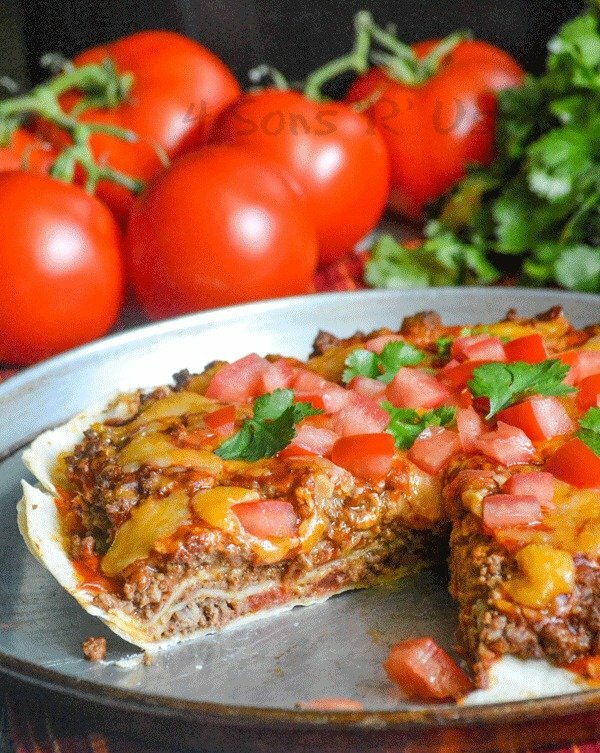 Topped with with a layer of savory red enchilada sauce, more beef, beans, and cheese, and some freshly diced tomatoes and savory cilantro leaves- this Meaty Double Decker Mexican Pizza is the answer to any Tex Mex craving. It takes your Taco Bell favorite and turns it into a meal fit for the whole family to savor and enjoy. 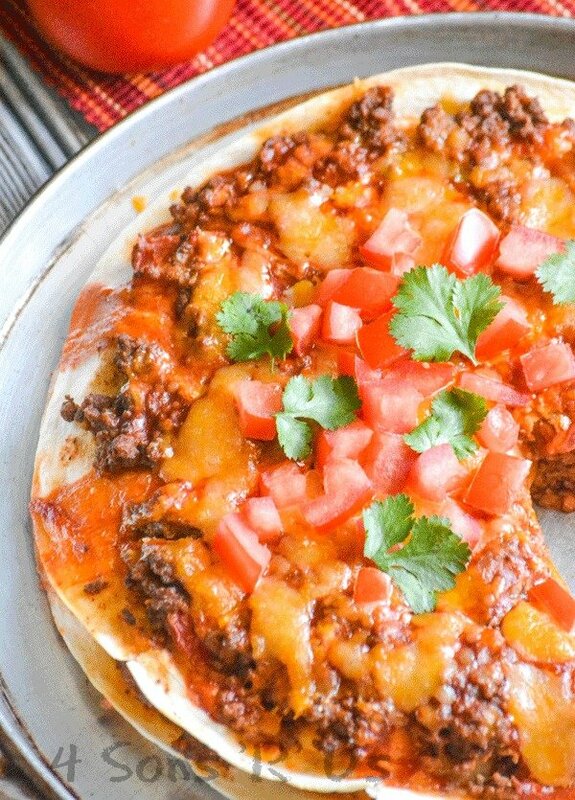 A heartier spin on the much loved Tex Mex Mexican pizza, this healthier version is loaded with ground beef and hearty enough to fill up the whole family. In a large skillet over medium heat, brown the ground beef- stirring and breaking up as it cooks- until completely browned. Strain, and return to the skillet. Stir in the beans until evenly incorporated and the mixture's smooth. Stir in the tomatoes and taco seasoning until evenly incorporated and the mixture's bubbling. Salt & pepper, if desired, to taste. Remove the skillet from heat. Lightly spray a pizza pan with non stick cooking spray. Place one of the tortillas flat in the center of the pan. Spoon 1/3 of the beef mixture out onto the tortilla and use the back of the spoon to spread out in an even layer, but don't spread over the outer edges. Sprinkle 1/3 of the cheese evenly out over the meat mixture. Top with another tortilla and repeat this a second time. Spread the enchilada sauce evenly out over top of the third tortilla. Top with the remaining third of the beef mixture and cheese. Top with diced tomatoes and cilantro leaves. 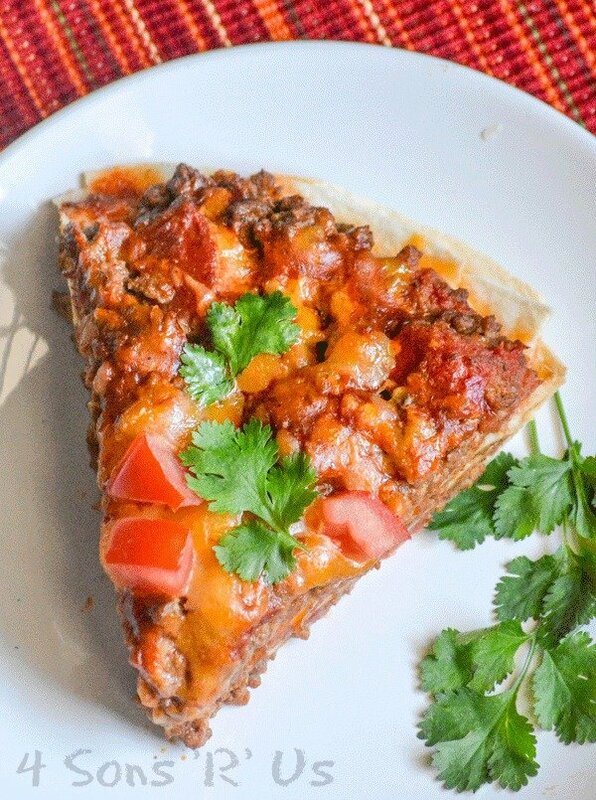 Use a pizza cutter to slice into 6 pieces, and serve immediately with sour cream on the side. Serve with a crisp side salad for a complete family meal.